WASHINGTON, DC, August 15, 2013 (ENS) – The first new carnivore species to be identified in the American continents in 35 years was introduced to the public today by the Smithsonian Institution scientist who recognized it from skins and skulls tucked away in the collection of the Chicago Field Museum. 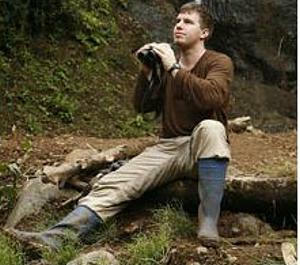 Kristofer Helgen, curator of mammals at the Smithsonian National Museum of Natural History, and his team uncovered the forgotten museum specimens in 2003 and followed a trail that took them from museum cabinets in Chicago to the cloud forests of Ecuador to genetics labs in Washington, DC. Their work resulted in today’s debut of the newest species of mammal known to science, the olinguito, (oh-lin-GHEE-toe) Bassaricyon neblina. While classified as a carnivore, the olinguito mainly eats fruit, but may also eat some insects and nectar. It is a member of the family Procyonidae, along with raccoons, coatis, kinkajous and olingos. Weighing about two pounds with large eyes and thick, woolly orange-brown fur, olinguitos are native to the cloud forests of Colombia and Ecuador, where they leap from tree to tree in the forest canopy. The smallest member of the raccoon family an olinguito’s head and body are about 14 inches long (355 mm), plus a tail 13-17 inches in length (335-425 mm). Males and females are similar in size. 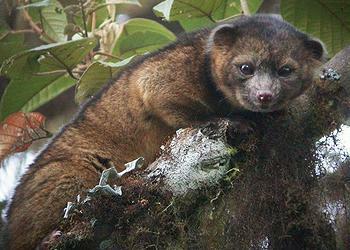 The olinguito was nearly identified several times during the past century and was even exhibited in zoos. A female olinguito from Colombia lived in various zoos in the United States during the 1960s and 1970s, but it was mistakenly identified as another species. “The discovery of the olinguito shows us that the world is not yet completely explored, its most basic secrets not yet revealed,” said Helgen. “If new carnivores can still be found, what other surprises await us? This is the latest in a long string of mammal discoveries for Helgen. In his fieldwork and museum travels around the world, the scientist has discovered 100 species of mammals previously unknown to science – about two percent of the global mammal fauna. Twenty-three of them have so far been characterized in published or pending journal articles. His discoveries include the existence of the western long-beaked echidna, one of the world’s five egg-laying species of mammal, once thought to be extinct in Australia; a giant monkey-faced bat in Papua New Guinea; and a flying fox bat from Samoa. In the case of the olinguito, Helgen’s team started with the need to understand how many olingo species should be recognized and how these species are distributed – issues that had long been unclear to scientists. The team studied more than 95 percent of the world’s olingo specimens in museums, commissioned DNA testing and reviewed historic field data, and found that the specimens in museums had never been properly identified. Field records showed that it inhabited a unique area of the northern Andes Mountains at 5,000 to 9,000 feet above sea level – elevations much higher than those inhabited by the known species of olingo. To determine whether olinguitos still exist in the wild, Helgen contacted Roland Kays, director of the Biodiversity and Earth Observation Lab at the North Carolina Museum of Natural Sciences, to help organize a field expedition. The team confirmed the olinguito’s existence with a few seconds of grainy video shot by their colleague Miguel Pinto, a zoologist in Ecuador. With only that video as a clue, Helgen and Kays undertook a three-week expedition to find the animal. Working with Pinto, they found olinguitos in a forest on the western slopes of the Andes. By observation they learned that the olinguito is mostly active at night, is mainly a fruit eater, rarely comes out of the trees and has one baby at a time. The team made special note of the olinguito’s cloud forest Andean habitat, which is under heavy pressure of human development. The team estimates that 42 percent of historic olinguito habitat has already been converted to agriculture or urban areas. The olinguito is so far known only from cloud forest habitats in Colombia and Ecuador, but future investigations might show that it lives in similar habitats in other South American countries.